The review will help you understand and integrate the latest guidelines and recommendations into your practice and even includes a bonus textbook. The 40th Annual Intensive Review of Internal Medicine is intended for internists (both academic and clinical), those preparing for ABIM internal medicine exams, and those looking for a comprehensive update in internal medicine. This is an online, self online CME self-learning program for therapeutic updates, best practices, and emerging therapies for Chronic inflammatory demyelinating polyneuropathy (CIDP). Chronic inflammatory demyelinating polyneuropathy (CIDP) is a chronic, acquired, autoimmune disorder affecting the peripheral nervous system. Occurring at an incidence of 4-9 people per 100,000, CIDP most commonly occurs in adults aged of 40 to 60, although it may also occur in children and the elderly. Meetings By Mail presents Cleveland Clinic’s Fundamental to Advanced Echocardiography. This activity meets Echocardiography Lab CME requirements for Physicians and Sonographers, and is also worth 21 ABIM MOC pointsThe program highlights practical issues in echocardiography, including new imaging technologies, multimodality imaging, the role of echo in clinical practice and guidance for structural heart interventions, as well as a focus on innovations. Several workshops will provide clinical guidance on echo’s optimal uses. Topics include assessment of the Left Ventricle, Valvular Heart Disease, 3D Echo, Strain, Pericardial and Myocardial Disease, Stress Echo, Advanced Techniques, Lab Fundamentals, Structural Heart Disease and much more! Developed by TMCI Global and the Society of Cannabis Clinicians (SCC), the Clinical Cannabinoid Medicine Curriclum is the first comprehensive, online CME-certified curriculum designed to educate the practicing clinician on both the research and clinical practice aspects of the therapeutic use of cannabis. Each course within the curriculum offers up to 1.5 AMA PRA Category 1 Credits™ and the complete curriculum is certified for up to 13 CME credits. * Includes a bonus module on Cannabinoid Chemistry authored by Dr. Raphael Mechoulam, a professor of Medicinal Chemistry at the Hebrew University of Jerusalem in israel and leading authority on Medical Cannabis science. Target Audience: All healthcare practitioners; the curriculum was designed to educate the practicing clinician on both the research and clinical practice aspects of the therapeutic use of cannabis. Purchase grants one learner one year’s access to lessons and quizzes (access expires 365 days from date of course activation). This course covers 20 of the most essential procedures needed to work in the ER, ICU, and hospital wards, including the procedures needed for trauma management in the ER, and includes 4 hours of hands-on ultrasound education. Course topics cover vascular access, arterial line placement, point-of-care ultrasound, mechanical ventilation, informed consent, procedural sedation, tube thoracostomy, thoracentesis, lumbar puncture, paracentesis, airway management. Lab skills cover vascular access, ultrasound, airway management, lumbar puncture, thoracentesis, chest tube placement, paracentesis, pneumothorax evacuation, and needle decompression. Accredited by Postgraduate Institute of Medicine. Save $50-$150 with early registration at least 30 days before start of course. Exciting locations including Las Vegas, Chicago, Washington D.C., San Antonio, Seattle, and Long Beach. Summary: Neurology for Non-Neurologists is a comprehensive CME activity that will provide the learner with the opportunity to improve knowledge, competence, and performance in all subspecialty areas of modern clinical neurology. The activity comprises 50 thirty-minute videotaped presentations, by way of PowerPoint slides, delivered by acclaimed experts their respective fields,. This program will offer the learner the chance to experience the depth and breadth of the ever-changing field of clinical neurology as seen in the office of the primary care physician. Obtaining knowledge and understanding the education at the busy practioners own time and pace, the attendee will also gain confidence in his or her competency to skillfully diagnose and manage appropriately patients with neurological disorders. Identify different and various forms of agitation among patients with Alzheimer's disease (AD). A two-part audio series examining the clinician’s role in combatting an opioid epidemic that grips our country. Includes review cards. Summary: Perioperative Management is a home-study program intended for practitioners to limit patient risk by way of proper preoperative evaluation, intraoperative management, and postoperative care. Included topics are The Perioperative Stress Response, Preoperative Evaluation: Optimized, Not Cleared, Surgical Site Infections, Evidence-Based Preoperative Testing, Improving the Quality of Sepsis Care, and more. This course is designed for anesthesiologists, internal medicine specialists, family practitioners, surgeons, nurse practitioners, nurse anestrhestists, and physician assistants. 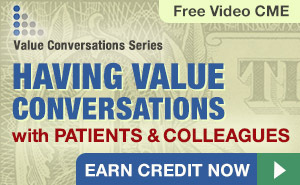 This convenient CME bundle features all five programs in our primary care series. - Dermatology, Psychiatry, Sleep Medicine, Sports Medicine and Symptom Evaluation. GET THE SERIES AND SAVE $880! Use coupon code PCSAVE. Only one coupon code or premium per order. U.S. residents only. Oakstone Primary Care Series - Clinical Update. A comprehensive review of the screening, diagnosis and management of sleep disorders in primary care practice. Ideal for MOC. Learn to recognize, diagnose, and treat sports medicine injuries you see on the field or in the office. Earn CME credits and get up to speed on current treatment protocols and return-to-play guidelines. Ideal for MOC. Business and management know-how you need to survive in an increasingly competitive healthcare environment. A four-part lecture series covering topics in insulin replacement for patients with type 2 diabetes mellitus (T2DM). To better manage commonly encountered chronic medical problems like diabetes, hyperlipidemia, obstructive lung disease, osteoporosis, headaches, and gout. 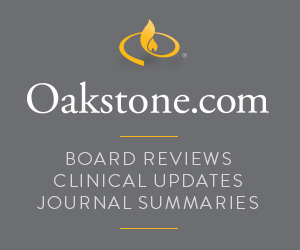 Review practice guidelines for atrial fibrillation, chronic kidney disease, coronary artery disease, contraception, anticoagulation management, and preoperative medical evaluation. To manage common problems such as heart failure, Hepatitis B & C infections, end-of-life care, rheumatoid arthritis, as well as recognize the indications for referral to a subspecialist.